I have decided to do a post about some of my recently completed work, these are only a selection of work I have done in the past couple of months. They include water damage repair, a wallpapering job and an emusioning job, coincidentally they are all bedrooms. The first job shown here was of a water stain to a ceiling and walls. 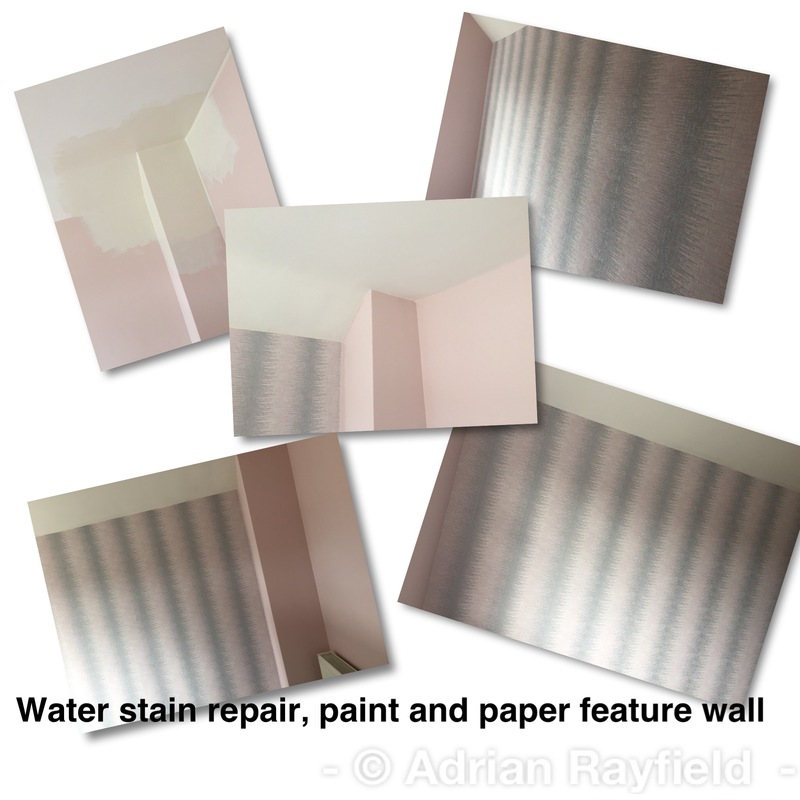 The stain was treated and then the ceiling was painted with white emulsion, with the walls being painted a pink tone emulsion. 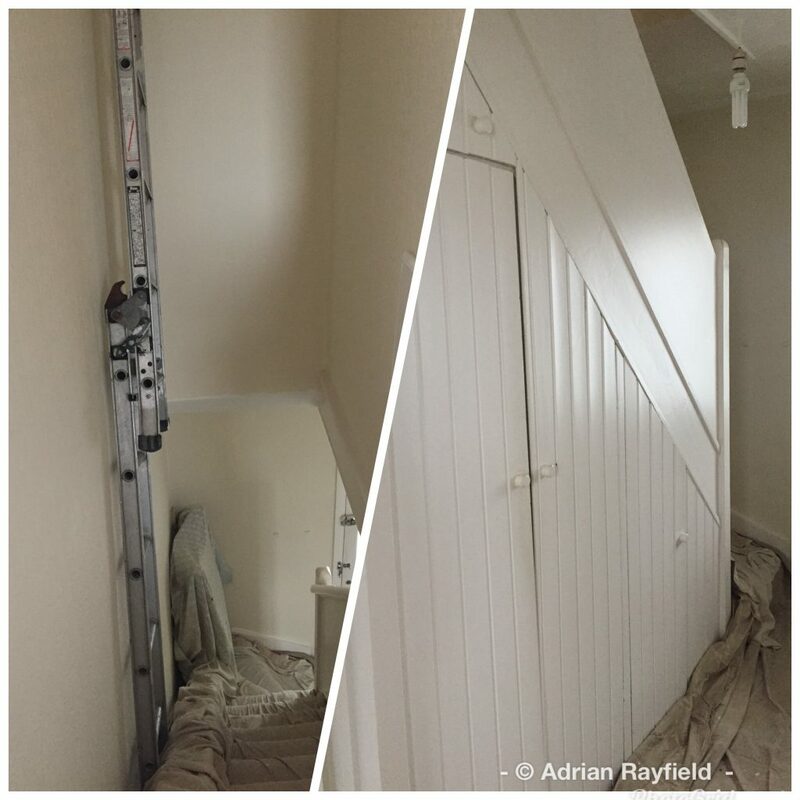 The woodwork was painted in white satinwood and finally a feature wall was papered to complete the job. 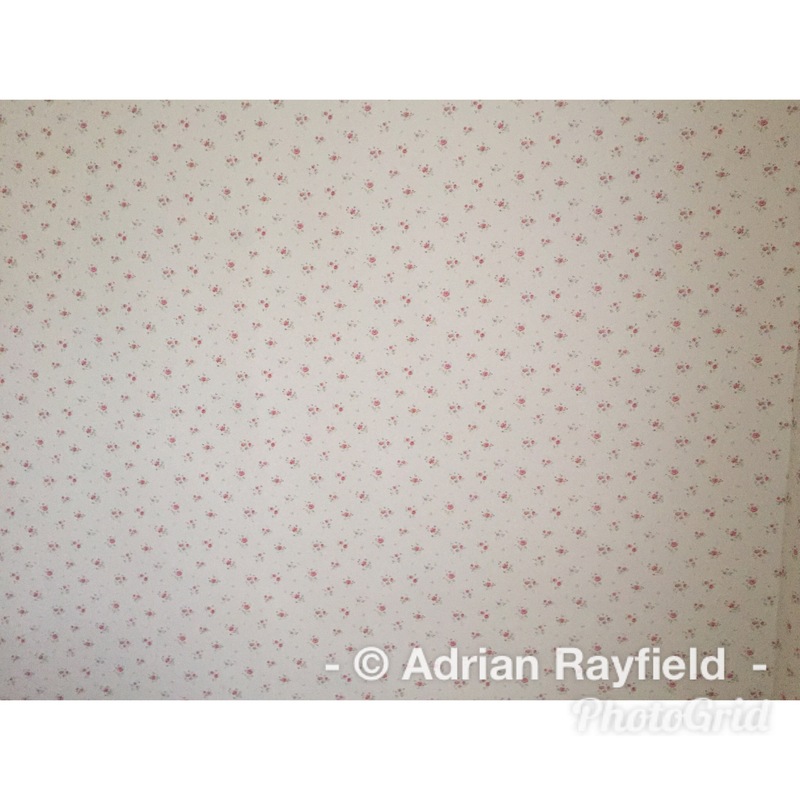 This job was a simple remove old wallpaper and border, paint the ceiling white and re-paper the walls with a floral patterned wallpaper. No woodwork was done. I removed the old wallpaper and border, filled some small holes and cracks before painting the ceiling with white emulsion. Finally I hung the floral wallpaper to complete the job. The third job I am showing you was a repaint in a bedroom. I started by filling some small holes, there wasn’t much filling to do as the ceiling and walls had been papered. 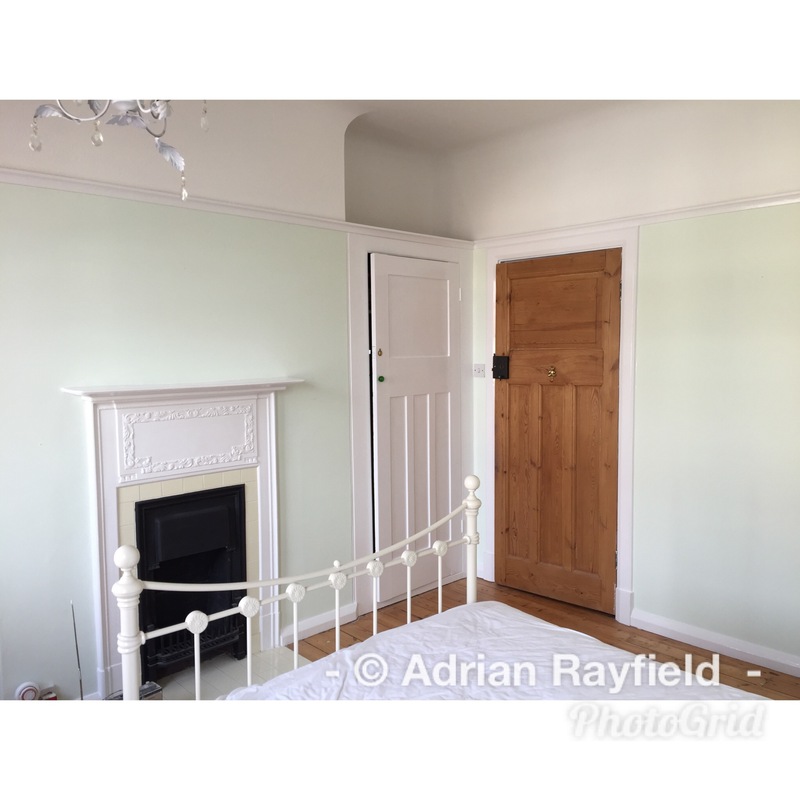 I then painted the ceiling down to the picture rail with white emulsion, then I painted the picture rail before painting the walls in a green colour. The remaining woodwork was painted with white satinwood. The door and floor was not touched, although I had previously varnished them. It is important when painting new wood to prepare the wood and paint it correctly, this will ensure the wood lasts for a long time. Most interior wood is softwood, such as skirting boards, door frames, architraves and doors. Whereas exterior wood can be both softwood, such as in fascia boards, but maybe hardwoods for windows and doors etc. This post mainly deals with softwood, such as pine, and painting the wood rather than staining or varnishing. Preparation is the first job for any new wood, a rub down to ensure the surface is smooth and ready for painting. If you are going to be painting the wood, that is to say not going to varnish the wood, you should apply kotting solution to the knots. This can be applied with a brush or rag. Some knotting solution comes with a brush. Apply two or three coats to the knots and let it dry. One the knotting is dry you can apply a suitable wood primer. 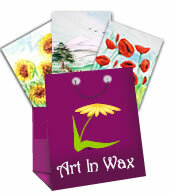 This can either be solvent or water based, I prefer water based as it dries quickly. Once the first coat is dry, lightly rub down the first coat and then apply a second coat of primer. Once this is dry, again give it a light rub down, you should now have a well coated piece of wood ready for an undercoat. An undercoat is used to allow a topcoat such as gloss or satinwood to be applied. Apply one or two coats of a suitable undercoat, for some paints a coloured undercoat can be used, such as a dark grey undercoat for a dark blue or black topcoat for example. 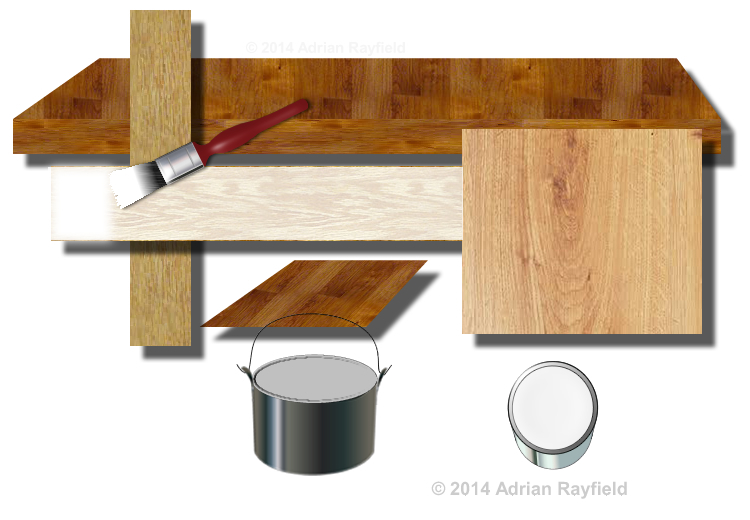 If you are applying more than one undercoat, leave to dry fully and give the wood a light sanding between coats. You may have to give the wood two undercoats depending on how well the wood is covered and how porous the wood is. Topcoat can be gloss, satinwood, eggshell, solvent based or water based they all come under the heading topcoat as it is the last coat or finishing coat to be applied to the wood. Once you have applied the primer and undercoat you need to rub the wood down a final time in preparation for the topcoat. Dust of the wood and make sure the wood is free from dirt and grease, then apply the topcoat to the wood. In some cases a second coat may be required, if this is the case allow the first coat to fully dry and then lightly rub the first coat with fine sandpaper and then remove any dust and apply the second coat. Giving a second coat can give a better gloss in the case of water based paints, it can also give a deeper, fuller finish. To paint new hardwood, such as a front door, the process is the same, you may not require any knotting solution as hardwood has far less knots. Again, rub down, prime, undercoat and topcoat ensuring you rub down between each coat to ensure a good smooth finish.